Wes Anderson's highly-anticipated new flick Moonrise Kingdom is, as several people have summed it up, "a gateway to fall back in love with Wes Anderson." The director known for stylized costuming, colorful sets, and innovative shot selection, doesn't win with this movie because of any of those things. Sure, they help, but what makes Moonrise Kingdom special lies in its heart. Anderson had that heart in full form in The Royal Tenenbaums, where aging patriarch Gene Hackman reconnects with his family and with his ability to love and live fully. Personal growth and acceptance, the regaining of self-esteem and humanity underline every aspect of that film, covering love and life and death in heavy, but never heavy-handed doses. That ideal fell off some with the The Life Aquatic, getting stuck behind style. And while it came back in force with The Darjeeling Limited, it wasn't quite the same. And it was more confined to the REAL problems of adults, which, let's face it, we're more and more reticent to face on film since we have to face them ourselves. 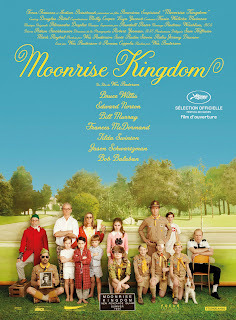 With Moonrise Kingdom, Anderson does something amazing. He shows us that as kids we strive to be adults, and as adults we forget what it's like to be kids... with the exception of the Khaki Scouts leaders. Sam and Suzy spend most of the movie acting the way they think they would if they were grown ups. Their experiences together are framed by their desire to be in love and to be treated like people, rather than children. Even the film's one major action sequence is framed by children trying to be what they think adults are like. Boys pretending to be men. But then, isn't that what a Scout organization is all about. It's an excuse to stop playing and start "surviving" even when in either case the root of it is human experience and intuition. So, as Anderson's child characters are busy reaching toward their perception of adulthood, all the adults are miserable in their own ways. Bruce Willis, Bill Murray, Edward Norton and Frances McDormand all have their own kinds of misery predicated on their focus on their perceptions of adulthood. Being career focused, being lost in love but dedicated to another, being browbeaten and being responsible for leadership but complete unsure about how to go about it. Essentially, the adults are the kids, but they don't know it. The kids want to be adults and they shouldn't. Instead, our wonderful cast of brilliantly designed and written characters battle what they know to be right. Love. It's love that drives this film, both of the other and of the self. And Wes Anderson's underlying message seems to be, love each other, and more importantly, never stop being a kid. Kids follow what they want. Kids are actualized. Kids even pretend to adults that are more interesting than actually being an adult could ever be. See this film. Don't miss it. Podcast: It's A Thing! #19 - "The New Sterility"